Through these five videos and taking your own confidential subconscious bias test(s) you can take an important step toward establishing more wholesome, effective, honest, meaningful, and joyful relationships with people distinctly different than or often people like yourself. 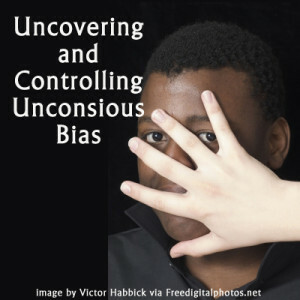 The process of uncovering your hidden biases requires reflection and a willingness to learn how you might improve.This program will help you explore your own thinking so that you can control your hidden biases and stop allowing your unconscious fears to control you. If you want to provide this training to your group or team and need to document that they took it and participated fully, we can arrange that for you. We do, however, charge a small fee ($10/person) to cover the cost of the staff time required to provide oversight, certification and documentation for your group. We also recommend pairing this with a live Q&A discussion for your team. Contact us to learn more. Anyone who wants to no longer be constrained by their hidden biases. This course is excellent for Certified Diversity Executive (CDE) and Certified Diversity Professional (CDP) seeking re-certification from The Institute for Diversity Certification (IDC). If you would like to self certify this course for continuing education self study credit, you can request a letter of participation inside the course. The course takes ~2 hours to complete.